Thanks for visiting my blog. I am Mahathi Ramya, a blogger, a mom of 2 boys, a software testing professional, an avid book reader and a classical dance teacher. My Blog "Fantastic Feathers" is about books, Parenting, and Travel. My favorite pass time is reading books of all genres especially fiction, mystery, psychological, humorous and emotional. I am a classical dancer and I like the quote 'Dance as no one sees you'. I know classical music, Veena, photography, and painting too, but I am still at a beginner level. I love traveling as it helps me to see the world and understand different people and new cultures. I like blogging, through which I can express my feelings. I have started this blog around 10 years ago, just to write about my feelings and share my book reviews. But, now it has become a part of my life. Mostly, you will see book reviews and travel experiences on my blog. Now, I am also writing on general issues and some random thoughts which are worth a share. Feel free to contact me for any request on book/ product/ website review. 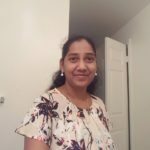 Hi Mahathi, do you write anything about software testing(as you have mentioned its your profession)? No Prasanna.. i didnt write anything on testing till now but i follow many testing blogs. Do you want any specific info on testing? Nice to see you as a Blogger. All the Best! Hey great to know you through your blog. Nice to know about you, I liked your blog. Your blog has been featured in Women Special of " My Sweet Nothings ". Kindly give your comments. Here's your Guest Post in Wonderful As Women ( WAW ) series of Women Special. Expecting your comments on this. Sure Vasantha, THanks. Will contact you. I write to you on behalf of Author Pooja Misha, who has recently published her maiden book, a Fantasy novel Seven Doors of Satan that transports the readers to a colourful world of magical and godly beings, exotic tribes living in harmony with nature and a battle between good and evil that challenges the inner daemons as much as the external ones for the characters. Pooja Mishra, a young and talented author (just completed her college) requires your encouragement for her new book to reach avid book readers and fantasy story lovers. Following is the link of author website for more information on the author and her book. Look forward to your support..